A Chinese foreign ministry spokesperson on Thursday called on the U.S. to adopt an open and inclusive mindset regarding technological development and progress of other countries. The United States is the No. 1 technological power in the world, but the country "should not allow solely its own development but no room for others' progress," spokesperson Geng Shuang said at a daily press briefing. Geng's comments came after Vice Chairman of the U.S. Senate Select Committee on Intelligence Mark Warner and senate minority leader Charles Schumer accused China of stealing American technology. It is unreasonable for the United States to wilfully slander and make accusations against other countries' technological development and progress, Geng said. "China's technological development does not come from stealing or robbing, but is achieved through wisdom and hard work of all the Chinese people, including scientists." Given that competition is a fundamental feature of the market economy, Geng urged the U.S. to view and deal with competition more objectively and correctly. The existence of competition between China and the U.S. in the technological field is absolutely normal, Geng said, adding that such competition is conducive to technological development of the two sides and the whole world, as long as it is fair and rule-based. "China stands ready to work with the U.S. to further strengthen exchanges and cooperation in the technology field so as to better benefit people in China, the United States and the whole world," he said. 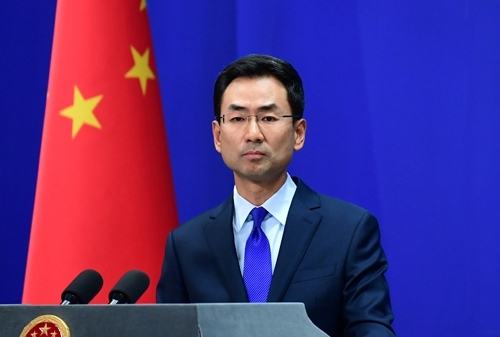 A Chinese foreign ministry spokesperson called on the U.S. to adopt an open and inclusive mindset regarding technological development and progress of other countries.